I finally am getting a chance to post the MRI picture of Shannon’s knee, in case any of you wanted to see it. 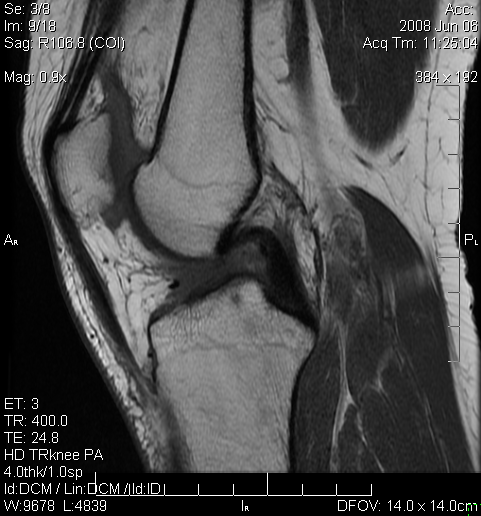 First, though, here’s a link to a site that shows an MRI of a normal ACL ligament. As you can see, the ACL goes diagonally from the lower left to upper right. Behind it is the PCL, another ligament that crosses it in an X from upper left to lower right (although in the normal MRI picture, it is a little hidden). Below is Shannon’s MRI. You can see the PCL clearly, but the ACL is totally missing! This entry was posted on Sunday, June 29th, 2008 at 10:13 pm	and is filed under Life. You can follow any responses to this entry through the RSS 2.0 feed. Both comments and pings are currently closed. First of I hope every thing is well now. I just went for my MRI and it looks just like yours. So…. Question is what did they do to fix it or did they do anything? Hope the pain ends soon this really hurts like Holy heck.